Spell Check. If you have never used Spell Check before, then you are in for a treat. 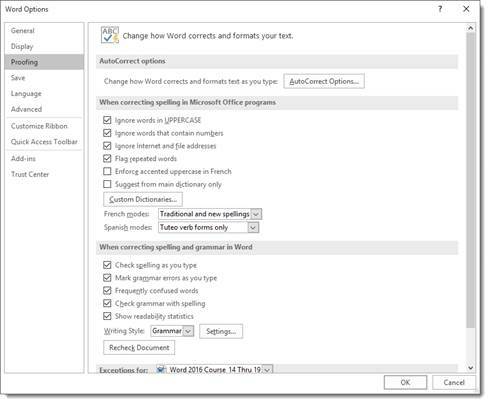 Spell check goes through your document from beginning to end (or just in selected parts) and selects misspelled words, grammatical errors, punctuation errors, and any number of other errors you want it to find. 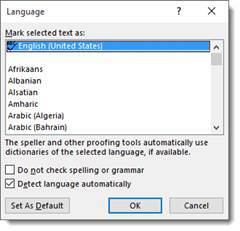 To locate Spell Check in Microsoft Word 2016, click on the Review tab, then click the Spelling & Grammar button on the left. You will see it on the far left. It is distinguishable by the large blue checkmark with ABC written above it, as in the picture below. The example above shows a spelling error. You can choose to ignore this instance of the correction suggestion, ignore all instances in the document, or add the word to the user dictionary so it will not be marked as a misspelled word again. If you add it to the dictionary, it will apply to all documents. You can also click on the File tab> Options>Proofing to establish the types of errors you want Spell Check to find and correct. Go to the "When Correcting Spelling in Microsoft Office programs" section. If you want to spot check a word that you have typed because you are not sure if you spelled it correctly, you can also use Spell Check for just that word. Simply right click the word and a list of possible substitutions will appear. Select the substitution you want by highlighting it and left clicking your mouse. Spell Check operates more efficiently, of course, if it knows what language to use when proofing your document. Set the proofing language by going to the Language tools on the Review tab. Click the language button and select Set Proofing Language from the dropdown menu. 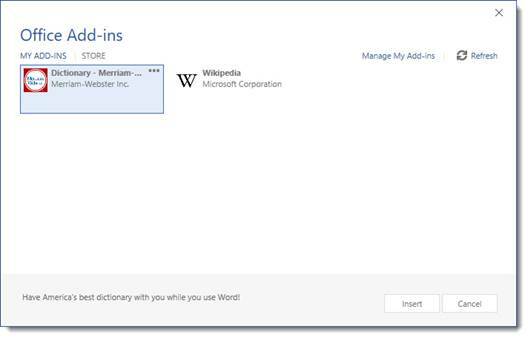 Microsoft Word also helps you find synonyms for words that you have used by providing a thesaurus that is automatically integrated into Word. To use the thesaurus, click on the Review tab (this is your editing tab) in the Ribbon, then select Thesaurus. The thesaurus will appear on the right side of the screen. 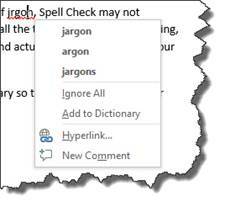 If you use Microsoft Word for business and find that you use a lot of jargon, Spell Check may not recognize the spelling of those words and highlight them as wrong all the time. This can be frustrating, and it can also mean that you start to ignore those flagged errors and actually overlook a typo on your part. Well, there is good news! You can edit the Microsoft Word dictionary so that it recognizes words or spellings that you use. You can even customize spellings. Click Options on the left side of the screen. 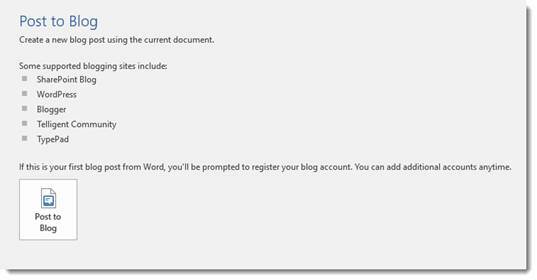 Type in any words that you may use that are not recognized by the Microsoft Word dictionary. Alternatively, you can right click on any word that Microsoft Word marks as misspelled, and click Add to Dictionary. To check the word count of a document, simply look at the bottom left-hand corner of the screen. The first column you will see tells you the page count, and the second one tells you how many words are currently in your document. You can select a passage of text to find out how many words are in the selected portion also. Microsoft Word allows you to track any changes that you make to a document. This is helpful if more than one person is working on the same file, if you have an editor, or if you simply want to be able to see changes you have made and be able to refer to the "old" version. As with most of the editing features on Microsoft Word, Track Changes is located under the Review tab. You will see it right below Mailings in the Tracking Group. By clicking on Track Changes, Microsoft Word will mark everything that you change. In the picture above, Track Changes was used. The words that were replaced were struck through and in red. The new words were also in red, but underlined. These are proofreading marks that Microsoft Word uses. You can also click on the Reviewing Pane button in the Tracking group to see the changes that have been made. This appears in a pane at the left side of the document window. You can also have all changes noted in balloons on right side of the document. Simply click on the Show Markup button, then select Balloons (by Track Changes) and select the option you want. Below is a picture of revisions shown in balloons. When you are done editing and proofreading your document, as well as making changes, you can do one of two things. You can read through the document with the changes you have made, but without the proofreading marks, to see if you have caught every error and made all the changes that need to be made. In other words, you can see if you are happy with the final draft. To turn off the proofreading marks and view your revised document, click on the Show Markup button. To see the proofreading marks and comments again, simply go back to Show Markup and recheck your selections. When you click the Simple Markup button that is above the Show Markup button, you can do several things. You can view the final copy of your document showing proofreading marks and comments. You can view a final copy of the document without any proofreading marks. Original Markup allows you to view the original document with the original changes. Whenever you make a change using the Track Changes feature, you or whoever owns the document can then go through and either accept or reject the suggested changes. All changes made to a document are only proposed changes until they are accepted or rejected. There are two ways to accept and reject changes. The first and most commonly used way is within the body of the document. You can select, then right click on any word, sentence, or paragraph for which a change has been suggested. When you right click, you will see a drop down menu. Accept or reject change will be one of your choices. Select one or the other. When changes have been noted in a balloon, you can right click on the balloon and either accept or reject the change. The other way is using the toolbar located in under the Review tab and in the Changes group. You can click on accept, then choose accept and move to the next suggested change or accept all changes within the document. Clicking reject will give you the same options. Previous and next will take you from suggested change to suggested change until all changes within the document have been accepted or rejected. Sometimes when you are working on a document, you will want to make notes to yourself or someone else. For example, you might want to leave yourself a note that says "revise this paragraph." If someone else is reviewing or editing your document (or you are reviewing someone else's), it is also handy to be able to leave notes for them. As with previous versions of Microsoft Word, you can leave comments in a document. To insert a comment into a document, first click on the place in the document that you want to comment on. Next, go to the Insert tab and click Comment in the Comments group. Type your comment in the box that appears to the right of the document. Press the ESC key when you are finished typing the comment. In previous versions of Word, if more than one person left a comment in a document, comments from different people would be left in different color balloons. For example, Joe's comments might be in a red balloon. Sarah's comments may be in a green balloon. Jane's comments might be in a blue balloon. In Word 2016, you can respond to comments within the same balloon. To leave a comment within a comment, click the page icon on the right hand side of the screen. As you can see below, Word will then give you a place to reply to the comment. To delete a comment, click within the comment, then right click and choose Delete Comment. Print layout. Shows how your document will look when it is printed. Read view. You view the document in full screen so that the space is maximized for reading or commenting. Web layout. See your document as it would appear as a web page. Outline. Your document as an outline with outlining tools. Draft. Elements such as headers and footers will not be visible in this view, enabling you to read or edit the document quicker. Changing the page view may be done by selecting the View tab, then clicking on the appropriate icon in the Views group. In Read mode, you can flip through pages by clicking the arrow located on the left side of the page (halfway down the document) to go back a page, or you can click the arrow on the right side to go forward a page. At the top left of the screen, you have menu commands that help make reading and editing your document easier. The File tab is the same as it is in any view. Under the Tools menu, you can search using the Bing search engine. If you want to search for a meaning of word or anything else, you can highlight the word or text, then go to Tools and select Smart Lookup. You can also use Find under the Tools menu to find the thing within the document. Now let's look under the View tab. You can select Edit Document to go back to editing your document in the regular screen. 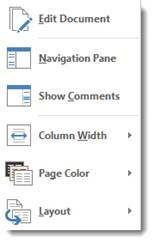 You can click Navigation Pane to display the Navigation Pane. Click Show Comments to see all comments. Click Column Width to adjust column width. You can also adjust the page color and the layout. To return to your "normal" document and exit Reading view, select Edit Document. To edit a PDF in Word, go to File>Open and locate the PDF. Click Open when you find the file. Word opens the document in a new file. Just keep in mind that it might not look the same as it did in PDF form. The page breaks may be in different spots. Text boxes and graphics might be misplaced too. This feature works best with documents that are mostly text, so just be warned. Now, once you have the file open, you can make any changes you want. When you are finished, go to File>Save As, and save it as a PDF file again. Smart Lookup allows you to do online research or define words with the click of a button. To use it, select a word or phrase in the text and click the Smart Lookup button located on the Review tab. The Insights pane opens on the right side of the Word application window. There are two tabs: Explore and Define. Word uses the selected term to search the web and displays the results in the Explore tab. You may see results from websites like Wikipedia. 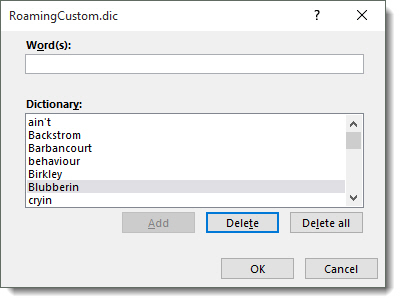 The Define tab will give you a dictionary entry, as seen in the sample below. In addition to using Smart Lookup as a dictionary, you can also use it as a research tool. 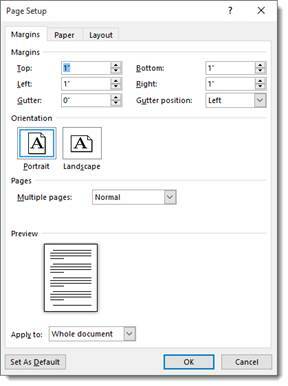 Simply select a word or phrase in your document and quickly find information about it. Let's say we were creating a document about alternative housing. In one part of our document, we mention silo houses. In Word 2016, we could select the phrase "silo houses," then right click and choose Smart Lookup from the menu. The Insights pane opens on the right side of the document with Bing search results related to "silo houses". Research results are always listed under the Explore tab, whereas definitions are under the Define tab. Click on any of the links shown in the Insights pane. The link will open in your web browser. 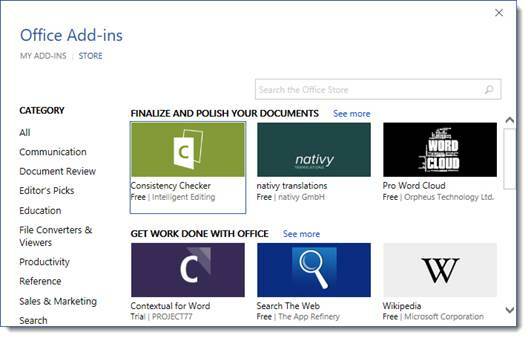 Word 2016 gives you the ability to download apps (called "Add-Ins") from the Office store that you can use in Word. These apps can include thesauruses, dictionaries, encyclopedias, and other tools to automate tasks or simplify them. To search for and install add-ins, go to the Insert tab, then click the Store button. You can search for Add-ins using the search bar, or you can browse by category. Some are free. Some you will have to buy. You can manage the add-ins you have already inserted into Word by clicking the My Add-Ins button. To use an add-in, or to install it, simply select the add-in, then click the insert button. Translate is located under the Review tab. Using translate, you can translate a document from or to numerous languages. Just click Translate. You can then choose to have Word translate the entire document, selected text, or to point to a word or phrase for quick translation. You can also select Choose Translation Language to select a language, as shown below. Your document is then machine translated. 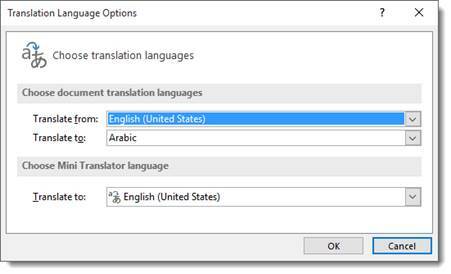 You must give Microsoft Word permission to send your document to the machine for translation. To print a document, click File>Print. Click the Print button to go ahead and print -- if you are ready. However, it is always a good idea to set options first. 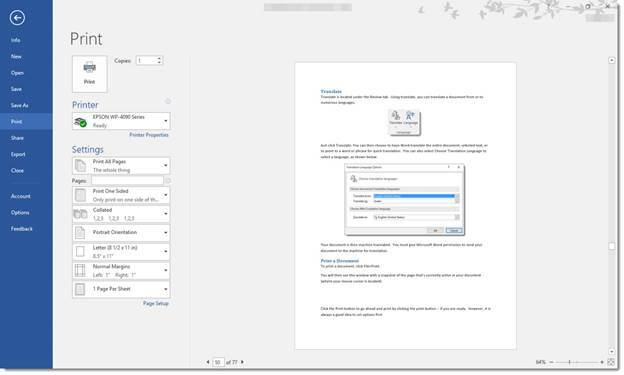 Under the Settings category (shown above), you can tell Microsoft Word if you want it to print the entire document, or specify pages to print by listing the page numbers separated by commas. You can also set your paper size, margins, and how many pages of your document you want to print on one sheet of paper. If you click Page Setup, you can change margins, layout, and paper size from this window also. When you are finished, click Print at the top of the window, as we showed you before. You can easily share documents without having to send them via email as large attachments. To be able to share your documents with others for review or editing, click the File tab, then click Share. Now, choose how you would like to share the document. Invite people is cloud-based sharing. First, save your document to your Microsoft OneDrive, then invite the people who you want to be able to view it. Email allows you to send the file by email using your default email program. The document is sent as an attachment. Present Online allows you to present the document online. Microsoft gives you a link to your document that you can share with other people, as explained below. Word 2016 makes collaborating on documents easier than it was it previous versions with the introduction of the Share button. 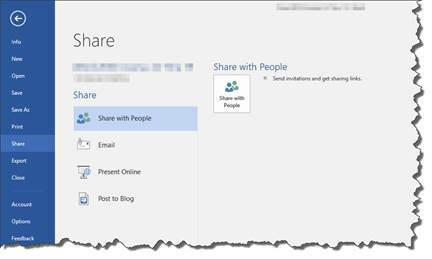 The Share button allows you to share documents as you work on them in Microsoft Word. In other words, you can share an open document so that you and the people you are sharing the document with can work on it at the same time. In previous versions of Word, you were required to save the document to OneDrive, and only one person could edit the document at a time. 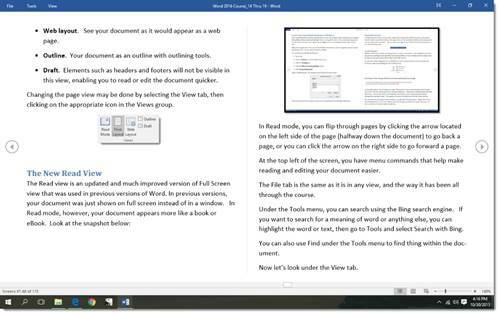 The Share button in Word 2016 is located on the upper right hand side of the screen above the ribbon. To share the document that you currently have open, click the Share button. You will then see the Share pane on the right hand side of your screen. Click the Save to Cloud to save your document to OneDrive. Once you've saved the document, go back to the Share pane. 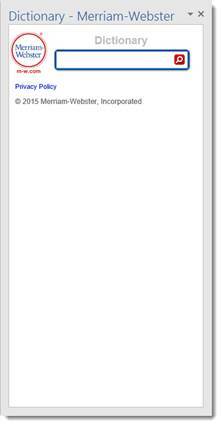 In the Invite People field, enter the email addresses of the people with whom you want to share the document. In the dropdown field below the Invite People field, specify what these people are allowed to do to the document. Next, go to the "Automatically Share Changes" dropdown menu. Decide if you want Word to automatically share changes with you. If you do, select Always. Otherwise, select Ask Me or Never. When you're finished, click the Share button. An email will be sent to the people with whom you've shared the document. It will contain a link for them to view the document in OneDrive. 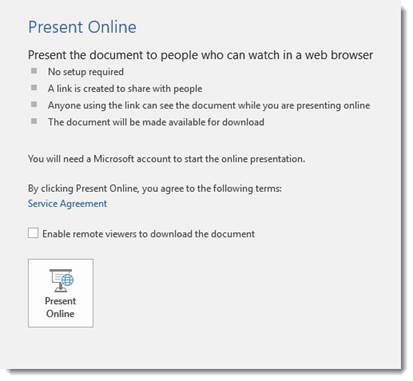 You can also share the document by sending people the link to the document in OneDrive. To do this, go to the bottom of the Share pane, and click the "Get a Sharing Link" link. You can then choose to create an editing link, which means anyone who receives this link will be able to edit the document – or a view-only link. If you send someone a view-only link, the recipient will be able to view the document, but won't be able to make changes to it. Whenever someone is editing your open document, you will see a message below the Share button that lets you know who is making changes. You will also see a flag in the Word document. The flag represents the cursor of the person who is also viewing and editing the document. Each person with whom you share the document will have a different color flag. The changes and additions they make to your document will appear in real-time. You do not have to wait until they save and close the document to see the changes. This is the new real-time typing feature in Word 2016.